I applied Crazy Color in Bordeaux nearly 2-months ago, and the color is still there. 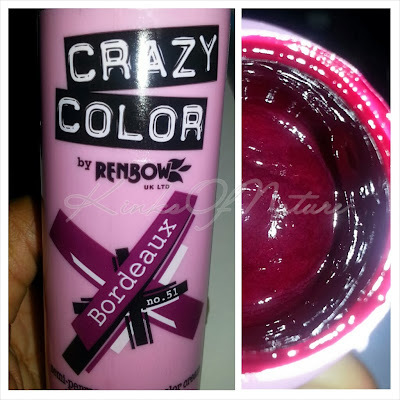 Product Claims: Crazy Color does not require the addition of peroxide. For optimal results, apply to pre-lightened hair. Ingredients: Aqua (Water), Cetearyl Alcohol, Ceteareth-20, Distearoylethyl Hydroxyethylmonium Methosulfate, Ceteareth-30, Citric Acid, Formic Acid, Methylchloroisothiozolinone, Methylisothiazolinone, Basic Blue 99, Basic Orange 31, Basic Red 51, Acid Red 52, Basic Yellow 87, HC Blue 15, D & C Red No. 33. Thoughts: At first I didn't care for the color, but now that I've grown to like it, I want it gone simply because I am sick of the mess it creates. It hasn't faded despite my attempts at removal. Even though the color bleeds with the most minuscule bits of moisture...it refuses to leave! I've shampooed 40 times at least, tried bentonite clay, tried shampoo mixes with lemon juice, and somehow the color became more noticeable. Normally I wouldn't mind. I'm used to semi-permanent colors bleeding, but not for 2 months. This limits when I can do wash and go's. Since I don't want to get Bordeaux all over my clothes and floors, I have to blow dry, which is no quick task. It takes a couple hours to complete a style I'd normally do in 30 minutes. To avoid the mess, I've been sticking to buns and the occasional blow out. I've barely worn my hair out. Crazy Color doesn't have a distinctive fragrance, but faintly smells of citrus. These semi-permanent colors are available for under £4 (4oz) from local (UK) beauty supply stores and online retailers. One bottle was one application on my hair. Would I repurchase? No. Although there's good color payoff, the mess is too much of a hassle. I've used other semi-permanents that do not bleed as much but are still easier to remove. Check out my color progression with Crazy Colors on Instagram! All page links are below.